Two TV ads, one urging President Trump to withhold federal funds from California’s sanctuary cities and another asking how many more lives will be lost before California politicians stand up for Californians. Long known for its car culture, Californians continue to love their cars. 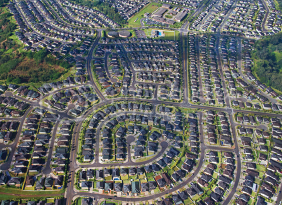 Urban sprawl’s consequences are more severe than rush hour traffic jams, as evidenced by several recent examples. There is no evidence of widespread voter fraud some groups say. Fair enough. Of course, absence of evidence is not evidence of absence. My first message as CAPS President appeared in the Spring 2017 Newsletter. Since then the media has been filled with reports of (sometime violent) battles between persons on the extremes of the U.S. political spectrum. 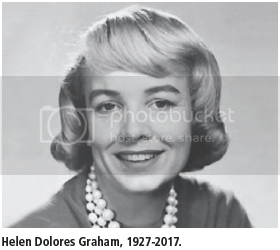 Helen Graham was a registered lobbyist for Zero Population Growth in Sacramento for several years before becoming the first Executive Director of CAPS in 1986. California’s huge human population of nearly 40 million has massive negative impacts on nature. A 350-square-mile saltwater lake, the Salton Sea parallels the San Andreas Fault and sits atop the Salton Trough Fault in Southern California’s Imperial and Coachella valleys. CAPS advocacy is a key component that directly connects our membership with our mission. Please join us in welcoming Allan F. Brown and Don Rosenberg to the CAPS Board. Toby Nicole White, CAPS Public Affairs Coordinator, took to the Board of Supervisors’ mic in Santa Barbara County to address SB 1069. Two TV ads, one urging President Trump to withhold federal funds from California’s sanctuary cities and another asking how many more lives will be lost before California politicians stand up for Californians, aired in San Francisco, Los Angeles and Sacramento in recent months. Photos of Drew Rosenberg, Kate Steinle and Jamiel Shaw – all killed in California’s “sanctuary cities” by people who entered the country illegally and took advantage of sanctuary policies – are in the ads. Drew was killed in 2010 by Roberto Galo who had been stopped by San Francisco police just months earlier driving without a license or insurance, going the wrong way down a one-way street. But Galo was released by San Francisco authorities, and charges were dropped. Galo was driving without a license the day he killed Drew. Galo, attempting to beat oncoming traffic, made a quick left turn at an intersection, and collided with Drew who was in the intersection on his motorcycle. Eyewitnesses say after Galo’s car initially struck Drew, instead of stopping, Galo accelerated and ran over Drew. But the rear tire of Galo’s vehicle got stuck on Drew’s helmet, impeding the car’s forward mobility. Attempting to flee the scene, Galo backed his car up, running over Drew a second time. He then put the car in drive and ran Drew over a third time, only stopping as a bystander jumped in front of his car. Upon stopping the vehicle, Galo’s front tire rested on Drew’s abdomen. Five bystanders lifted the car off Drew. But it was too late. Long known for its car culture, Californians continue to love their cars, as evidenced in the stats – transportation accounts for approximately 40 percent of CO2 emissions in the state, according to the California Air Resources Board. While the state is committed to lowering greenhouse gas emissions from all sources, the overall rate of reduction of these gases is slowing, and fingers are pointing at vehicles. Following steady declines since 2007, vehicle emissions in the state increased by 3 percent in 2015, per a CARB report released in June. This increase equals 4.6 million metric tons of carbon released into the environment. Last year, more than 2 million vehicles were sold in California, contributing to the country’s total sales of 17.55 million vehicles, with truck sales outpacing car sales – and trucks are generally considered bigger environmental offenders. Looking on a larger scale, China has ramped up rapidly on motorization in recent years, and now has annual sales of 20 million. Worldwide more than 85 million new cars are sold each year now – and each one has an impact. Even the hybrids and electric vehicles, which still only account for a small percentage of sales and will for the foreseeable future, have environmental impacts. Car sales are driven by a variety of factors, but one factor is more people. Since 2007, California has grown by about 3 million people – from 36.4 million to 39.5 million. By 2050, the California Department of Finance estimates the state will have more than 51 million people. In car-focused California, more people generally means more drivers. California’s leadership prides itself on being environmentally forward and progressive on meeting climate change head-on. Yet, they consistently fail to factor in the impacts of population growth and the positives of a sustainable population in the ability to achieve sustainability objectives. California’s annual wildfires struck early this summer; rescue crews’ efforts to reach inaccessible areas were slowed, and the delays caused forced evacuations from flame-engulfed homes. In Northern California, which has the state’s five fastest growing counties, dramatic, unsustainable population growth created a need for more housing, mostly built in outlying areas, in some cases hard for firefighters to access. In Houston, Hurricane Harvey obliterated hundreds of homes and cost dozens of lives. New arrivals to what is now the nation’s fourth largest city have been crammed into cheap developments built atop swampland. Between 1995 and 2015, Houston experienced a 42 percent population growth as urbanization overwhelmed 25,000 acres of swampland and grassy meadows, ill-suited to tract housing. The population future for both California and Texas is grim. By 2050, California’s population will increase from today’s nearly 40 million to more than 50 million, a 25 percent rise. Texas, according to the Census Bureau, has five of the nation’s fastest growing cities, and Houston is poised to overtake Chicago as the third largest metropolis in the U.S. There is no evidence of widespread voter fraud some groups say. Fair enough. Of course, absence of evidence is not evidence of absence. We currently have no way of checking the amount of voter fraud. Our democracy and freedom are too precious to take for granted, so we must be vigilant in assuring that our electoral process is fair and free of deceit. CAPS supports the efforts of the Election Integrity Project to ensure a system of elections based upon “every lawfully cast vote accurately counted.” The group is concerned that bloated and inaccurate voter rolls, lack of voter ID requirements, and deficient poll worker training could lead to tainted election results that do not reflect the will of American citizens. Moreover, the failure to enforce our laws against illegal immigration increases the population of potential illegal voters. The watchdog organization, Judicial Watch, has sent a letter to the California Secretary of State on behalf of the Election Integrity Project, alleging that the state may be out of compliance with federal law. The concern is that voters who move or die are not removed from the voter rolls, facilitating the prospect of voter fraud. Some specific examples are August 2017 events in Charlottesville, Virginia, and various clashes on college campuses. As best as I can tell, these latter types of clashes usually occur when speakers of the rightwing (conservative) persuasion have been invited to speak, drawing the rancor of their opposition. In a democracy, free speech and reasoned discussions of complex issues are essential if these goals are to be achieved. Unfortunately, population growth dilutes democracy, making it harder for individuals to be heard (I hope to return to this theme, in a quantitative manner, in a subsequent newsletter). Over the years CAPS has been attacked by persons and organizations on both ends of the political spectrum. Those on the left often try to tar us with the “racism” or “xenophobia” brush, while those on the right sometimes accuse us of being leftwing environmentalists. In my opinion, if CAPS is being attacked from both the left and the right, then we likely are doing something right. Some major political organizations routinely employ tactics that Senator Joseph McCarthy used in the 1950s – silence your opposition by use of name-calling and guilt by association. Their ploy is to attack messengers rather than to discuss issues – in this case, endless U.S. population growth. For an example of one such organization, please see SPLCTruthReport.com. Demonization of one’s opponents engenders hate and negates any chance for reasoned discussions. Two personal experiences illustrate this. Some years ago, I was a member of the Board of Directors of a large, well-known environmental organization. I was involved in some bitter battles, including how best to address endless U.S. population growth. I tried to always focus my words and efforts on issues and not on presuming underlying (hidden) motivations of my opponents. Unfortunately, some other Board members sometimes did not address issues, but impugned the motives of those with whom they disagreed. Since it is virtually impossible to discern underlying motivations of people one does not know well, we should stick to debating issues. A second experience involved a recent benefit concert for the Santa Monica Symphony Orchestra. There was controversy leading up to the concert because Dennis Prager, a well-known conservative talk radio host and columnist for the Los Angeles Jewish Journal, was invited to conduct a Haydn symphony at the fundraiser in an extremely liberal community. Thankfully, a suggested boycott of the concert by the orchestra’s musicians did not occur. The concert was a rousing success as a fundraiser, and politics never came up. Rather, the audience – that included me, plus an impressive number of loud and enthusiastic fans of Mr. Prager – was treated to some fascinating dialog when Prager asked various members of the orchestra how and when they got interested in classical music and in their specific instruments. We need to learn to be willing to listen to persons with whom we disagree and ask that they, in return, be willing to hear us out. Graham previously had been President of the Minnesota Young Republicans, appointed by Wisconsin Gov. Warren Knowles to the Wisconsin Commission on the Status of Women and then elected to the county board in Dane County before moving to Sacramento. Graham was a strong believer in Ward Connerly’s American Civil Rights Institute to promote a color-blind society. As recently as 2016 she gave media interviews for CAPS on our issues. She said CAPS was the only organization in California she knew of that works on all aspects of overpopulation. She lauded the members of the organization for having the courage of their convictions and working hard for the future of their children and grandchildren. California’s huge human population of nearly 40 million has massive negative impacts on nature. One of these negative impacts is on the populations of thousands of native species of plants and animals that share the state with us. According to the comprehensive, congressionally mandated 2007 report “California Wildlife: Conservation Challenges,” by the California Department of Fish and Game, California holds the shameful distinction as the state with the highest number of imperiled wildlife species. The state with the highest human population also has the highest number of threatened and endangered species? Hmm. Is this a mere coincidence? Of course not. Whenever biodiversity is trampled by overpopulation and excessive development, it is mashed and mangled. More than 800 species in California are at risk, including half of all mammals and one-third of all birds native to the state. Of these, 134 species were listed in the report as threatened or endangered, in other words, facing a real possibility of extinction or extirpation. Wherever human populations and demands on natural resources are high, aquatic species such as fish and mollusks (freshwater clams and mussels) often fare as badly as terrestrial species because of water pollution, dams, reduced water flows from diversions and withdrawals, sedimentation, proliferation of invasive species, and modified hydrology. Two doomed fish species are a sad case in point. According to UC Davis fish biologists Peter Moyle and Jason Baumsteiger, two species of California fish, one small and one big, are on the verge of imminent extinction in the wild. The tiny delta smelt (Hypomesus transpacificus) and the large winter-run Chinook or king salmon (Oncorhynchus tshawytscha) have long been in dire straits. The plight of these two ill-fated species illustrates how biodiversity and wild nature in California are being pummeled by a human population that exploded from a mere 1.5 million in 1900 to nearly 40 million today. 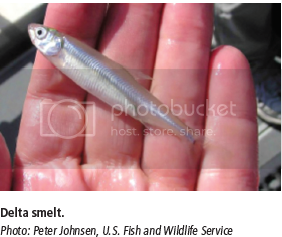 In stark contrast, only six eensy-weensy smelt, the lowest number ever, were counted in a survey by state fishery biologists in 2015. In previous years, up to several hundred had been surveyed. The expanding human population in California, in both its rural and urban dimensions, is exerting an ever-greater load on the environment – in this case, via ever-increasing competition for that most precious and limited of resources – water. At the moment, California is still luxuriating in water after the wettest winter on record, but if history is any guide, this won’t last. The delta smelt is a three to four inch, silvery-blue fish that lives only in the San Francisco Bay and the Sacramento-San Joaquin Delta. Its numbers have been decreasing for decades as enormous quantities of freshwater are diverted through the state’s vast network of aqueducts and canals. Once upon a time, the force of Sacramento River and San Joaquin River flows pushed back against tide-driven saltwater influx from the San Francisco Bay, preventing a salty wedge from protruding too far upstream into the fresher water (less brackish) delta. The delta smelt foraged in the brackish bay and spawned in the freshwater delta. This freshwater river flow also replenished Chinook salmon spawning grounds and freshened habitats (reduced salinity) in San Francisco Bay for waterfowl, Dungeness crab, and countless other aquatic flora and fauna in an immense system of sloughs, mudflats and marshes. 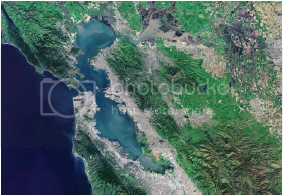 Now, however, most of that freshwater is diverted to California agriculture and sprawling urban areas. 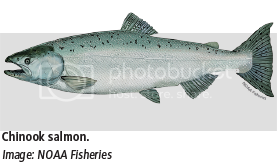 As a result, the Delta smelt and winter-run Chinook salmon are being squeezed out of existence. If they disappear altogether from the wild, they will join approximately 57 other fish species and sub-species declared extinct in North America since about 1900. 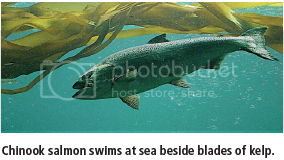 Seven fish species in California have already gone extinct. Extinction, like death, is a natural phenomenon. All species are doomed to die out sooner or later. Extinction occurred for eons before our own species strutted onto the scene. But Homo sapiens has now become life’s executioner. Biologists estimate that the rate of extinction has increased one-thousand fold above the natural background rate since humanity took dominion of the Earth. Leon Kolankiewicz is a wildlife biologist, environmental scientist, and planner. He is the author of “Where Salmon Come to Die: An Autumn on Alaska’s Raincoast” and the essay “Overpopulation versus Biodiversity” in “Environment and Society: A Reader.” He also is an Advisory Board Member and Senior Writing Fellow with Californians for Population Stabilization. A 350-square-mile saltwater lake, the Salton Sea parallels the San Andreas Fault and sits atop the Salton Trough Fault in Southern California’s Imperial and Coachella valleys. Even though it’s the state’s largest lake, the haunting Val Kilmer film of the same name may be better known. The Salton Sea’s attraction as a tourist destination is 50 years in the rear-view mirror, and the area today is challenged with unemployment that averages between 20 and 25 percent. 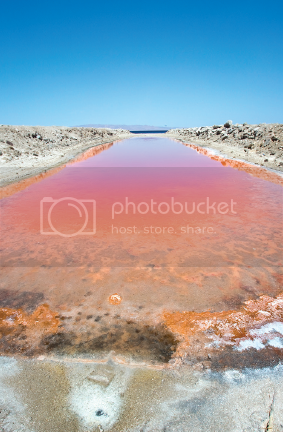 And if the lake does register on some level in the public consciousness it’s likely as a remote and very stinky place. Pollution from agricultural runoff and other sources has fouled the water and increased its salinity, resulting in algal blooms and massive fish kill-offs – thus the stink. But for all the downside, the birds love it. Millions of them still flock to the lake, which is second only to Texas’ Gulf Coast for the abundance and diversity of birds in the contiguous states, according to the Audubon Society. The failure of California to act in a meaningful and timely manner has real and imminent impacts on people and wildlife. 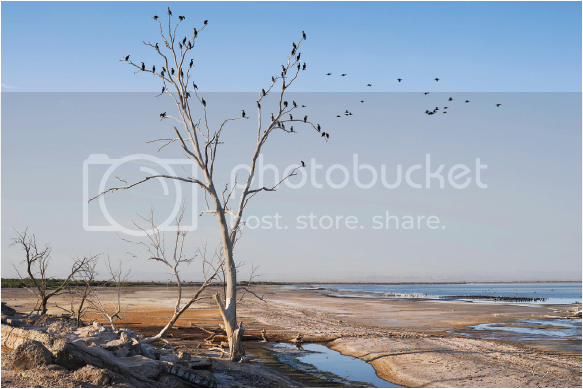 In the Bee commentary, Frank Ruiz writes that communities around the Salton Sea are experiencing increasing rates of asthma cases – “Albuterol inhalers are packed into lunch boxes along with sandwiches” – while avian populations relying on the Salton Sea to survive are crashing. Beyond the immediate area, if the Salton Sea is allowed to continue to degrade, impacts will be far-reaching as toxic dust from the dried-out lake blows through the state, along with hydrogen sulfide (a gas that smells like rotten eggs), two inputs for poor air quality. As the California legislature has been so focused in recent years on blurring the line between American citizens and conferring benefits on illegal aliens through numerous pieces of entitlement legislation, they’ve ignored many of California’s very real and pressing problems. 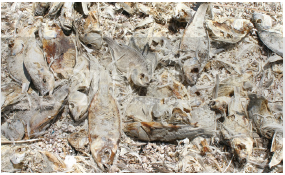 The Salton Sea is just one of the problems – and one very large problem. CAPS advocacy is a key component that directly connects our membership with our mission. If not for our members, we would not be able to do what we do. That said, we want to make the advocacy and alert process as efficient and pain-free as possible by providing timely information with easy-to-understand tools with which to act. We are therefore thrilled to share that we have partnered with an innovative frontliner in the time-sensitive, accuracy-crucial realm of today’s legislation. Our new action-based platform to convey CAPS news, current bills and legislation at the local, state and federal levels will enable our supporters to make their voice heard via the most intelligent and effective utilities on the market today. Introducing FiscalNote/VoterVoice platform – our new solution for managing government impact and public issues that is quickly becoming the cloud platform of choice for advocacy and communication from grassroots organizations to global brands. CAPS is excited to share this strategic endeavor with our supporters in our ongoing quest to empower and enable participation to be the most modern and seamless, while instilling confidence in our proponents that their votes, feedback and opinions are heard by leaders and legislators. We hope you will take a look at what we are doing to mindfully engage our membership as we stay current with leading technology. Allan F. Brown has joined the CAPS Board of Directors. A native of Palo Alto, Calif., Brown served in the Navy for one year at the end of WWII and for three years during the Korean War. He graduated from Stanford with a B.S. in Engineering in 1949. His working career was in the family construction company. 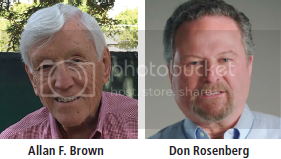 Though mostly retired, he still serves as Chairman of the Board of Vance Brown, Inc. He was also a founding board member of Mid-Peninsula Bank that grew to become Greater Bay Bank before merging with Wells Fargo. Brown served as board member and Chairman of the Sierra Club Foundation, Mid-Peninsula YMCA, Palo Alto Chamber of Commerce, Peninsula Open Space Trust and Channing House, a Palo Alto retirement home. He is currently an active member of the Yosemite Conservancy Council and the Advisory Board of Peninsula Open Space Trust and on the President’s Council of the Wilderness Society. He is a long-time supporter of CAPS, NumbersUSA, FAIR and several pro-English language organizations. Don Rosenberg is a new member of CAPS Advisory Board. From Westlake Village, Calif., Don is an entertainment executive, public safety advocate and father of three, one of whom was killed by an illegal alien. Rosenberg has appeared in TV spots for CAPS opposing California becoming a sanctuary state. He also is a cofounder of a new organization, Advocates for Victims of Illegal Alien Crime (AVIAC), a 501(c)(3) organization dedicated to promoting American safety and security. The issue of the number of legal immigrants came to the forefront when President Trump endorsed the new RAISE Act, significantly increasing the prospects that America might return to more traditional, lower levels of immigration. In a White House press conference, the President and sponsoring Senators Tom Cotton (Ark.) and David Perdue (Ga.) emphasized that a reduction in legal immigration and a shift to skills-based admissions would increase wages for U.S. workers and promote economic growth. This bill would, over 10 years, reduce legal immigration to about 500,000 per year, down from the current level of 1 million. RAISE also would retain preferences for the spouses and minor children of U.S. residents, but eliminate preferences for extended family members. The legislation would abolish the diversity visa lottery and return refugee admissions to traditional levels of 50,000 annually. The RAISE Act represents the type of immigration policy that America needs – reducing immigration to more traditional levels to protect American workers and threatened natural resources. After not fulfilling his campaign promise to rescind the DACA amnesty on “day one” of his administration, Trump finally announced a six-month phase-out of the program. Contrary to misleading media reports, it is not a six-month delay in ending the amnesty. Immediately, the government will accept no new applications for DACA. Illegal aliens whose work permits expire before March 5, 2018, can receive an additional two-year renewal, but they must apply by October 5. DACA work permits that expire after March 5 will not be renewed. Trump has called on Congress to enact legislation to remedy the situation. Some Republicans support the amnesty, but opposed Obama granting it by executive fiat. There will be pressure to forge a compromise that combines some form of amnesty for “dreamers” with increased border security. CAPS will actively monitor developments and keep you informed of imminent actions. A unilateral DACA amnesty, even through legislation, would likely encourage more illegal immigration. So, it is urgent to make E-Verify mandatory, limit chain migration and eliminate the Diversity Visa lottery. State politicians have been clamoring to resist enforcement of immigration laws since the election last November. Foremost among these efforts is SB 54, the notorious “sanctuary state” bill that seeks to bar cooperation between local officers and immigration authorities. In August, an illegal alien murdered his girlfriend two weeks after the Sonoma County Sheriff ignored an immigration detainer request and released the previously deported Guatemalan national. The sheriff’s office gave ICE only a 16-minute notice before he was released. As we go to press, SB 54 has passed the Assembly and House and has been sent to Gov. Brown. Some of the other efforts to thwart immigration enforcement fizzled. Bills to blacklist companies involved in the construction of the proposed U.S.-Mexico border wall went nowhere, and legislation to use taxpayer dollars to pay the legal costs to fight deportations of illegal aliens appears to be dead. AB 450 - requiring employers to restrict access to ICE agents and to alert employees to any planned federal immigration raids. SB 29 - prohibiting local governments and law enforcement agencies from contracting with companies that operate for-profit immigration detention facilities. AB 21 - barring state higher education officials from releasing information on the immigration status of students and staff and restricting access of ICE agents to campuses. Encourage friends, family and colleagues to get involved at the “TAKE ACTION” tab when they visit CAPSweb.org. 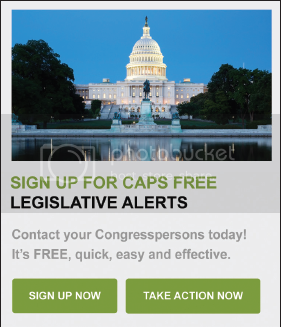 If you are not an Action Alert member and would like to join, visit our website or email us at membership@CAPSweb.org. Toby Nicole White, CAPS Public Affairs Coordinator, took to the Board of Supervisors’ mic in Santa Barbara County to address SB 1069, poorly defined state legislation taking effect January 2018 that authorizes statewide, city/county-regulated Accessory Dwelling Units (ADUs) for single and multi-family residents as an essential component to housing supply. Without an updated California Master Plan, provisions or standards for the current 3-4 million unpermitted ADUs, nor an ordinance for Junior ADUs (efficient, small units for workers, caregivers and singles), this bill – regardless of infill vs. sprawl positions – will not positively impact the dire state of our eco-footprint, nor our overpopulation crisis.